We've included listings for companies such as Master Wood Carvers and Cedar Creek Lumber LLC inside our Millwork guide. The 1950s are alive and well at this Texas company specializing in do-it-yourself door lite and side lite kits and mid-century millwork. This Ohio sawmill produces custom and stock mouldings, doors, stair parts, flooring, mantels and more in a variety of woods, including quartersawn oak. The company can also reproduce millwork from old houses. Tom's Quality Millwork and Hardwoods Inc. THis hardwood mill specializes in oak, poplar and maple boards, stair parts, beadboard and mouldings. The company is primarily a wholesale distributor, but will sell to individual customers. 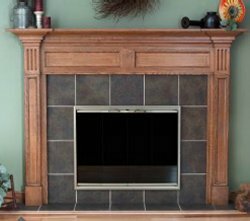 Custom manufacturer of high quality interior and exterior wood doors, moldings, fireplaces and wainscoting in a variety of styles and woods. This Texas company proudly boasts being "100 years behind the times" -- in style of woodwork, that is. Moulding and millwork from fancy gingerbread to screen doors to stair parts in various woods and PVC are sold online. This company's pre-manufactured wainscoting systems are aimed at do-it-yourselfers and contractors alike. Products are sold direct through the website, which also offers extensive installation tips and tutorials. Quartersawn oak mantels, just like they used to make them. 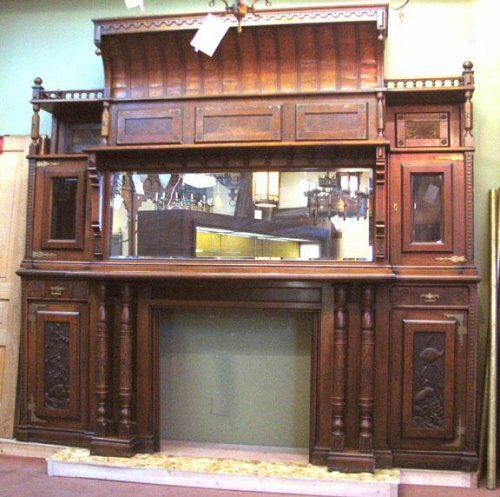 Mirrors, drawers, carvings and more adorn this antique fireplace mantel.